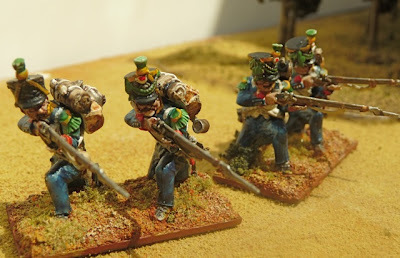 These voltiguers are the first off the painting table from the new Victrix French Napoleonic Infantry. As previously observed, I found these quite difficult to assemble. Generally, I do not like crouching figures as they are hard to set up in battalion order. Since I had no skirmishing stands for my French battalions, I thought that these 8 figures from the box could be used in skirmish order on 40 x 20 mm bases. Only 4 of the figures are voltiguers (the ones on your right on each base), but the differences are obvious only on the left side of each figure. I think it would be unlikely that I shall ever notice. All those little extra heads are very useful. I was hoping that they would be easy to paint, but I found them a little challenging. I suppose, that I have never painted such an elaborate uniform and the fact that they were in a crouching position made some of the details of the uniform difficult to tease out. Generally, GW washes were used over a white prime coat, with the details picked out using acrylic GW paints. Overall, I am not completely satisfied with the result, I feel I have done better. I shall have to see how the standing infantry figures go. 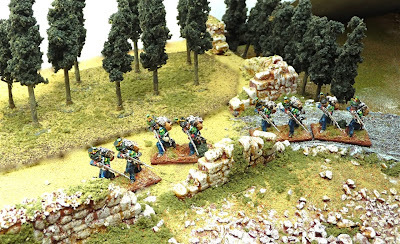 Fine painting, fine figures and on some of the most excellent terrain I've seen! I feel your pain on painting up the elite companies for the French. For me it is the coloured bands on the shakos which take so long to do. And those are just for the guys wearing the Bardin regulations- I've yet to takle the grenadiers and voltigeurs in their 1809 finery! I think you did very respectable work there John. Certainly there is nothing there I would be ashamed to have on my table! I appreciate your opinion, I am not happy with the blue I am using. I feel it is too dark. I almost think that I should be using a grey-blue for the basic french infantry figure. Between you and I, I actually do all my uniform research for my peninsular armies by watching Sharpe over and over again!! Their uniform colour seems some where between the Union and Confederate uniform colours of the ACW. They are very finicky uniforms. Anyway, I need to finish up the repair of my British forces and have to paint 12 additional figures to complete the disrupted battalions. My understanding is that the French blue was very dark indeed. I tend to lighten mine a tad, but only so that when/ if I ever get around to doing my Prussians, the latter will be even darker! But if you want a lighter blue- and why not, colours fade and there is always the issue of scale colour as well-I quite like the colour that this fellow created for his French (Perry plastics). Thanks Robert, I shall carry the discussion over to "La Bricole"